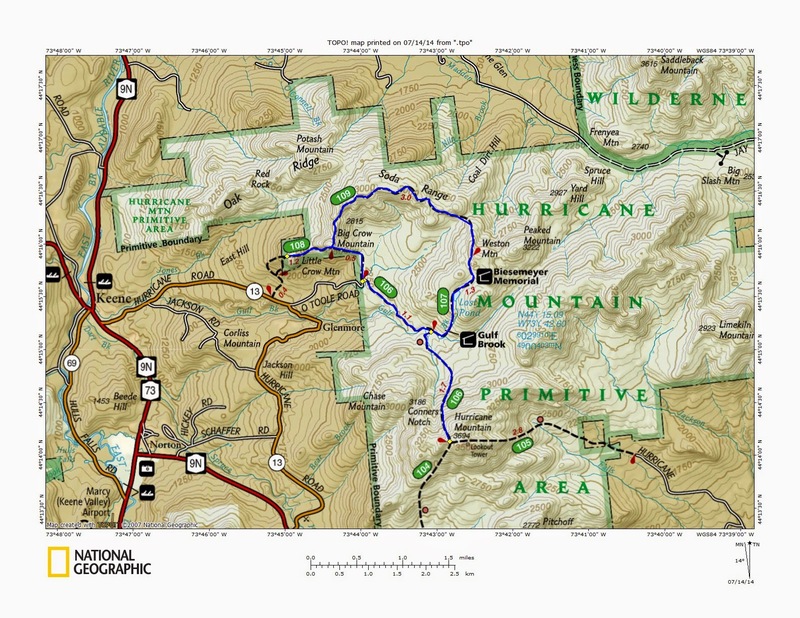 In the Hurricane Mountain Primitive Area lies an interesting loop hike, the Nun-Da-Ga-O ridge (also called the Soda Range). The hike is a combination of marked trail and herd path that is quite easy to follow. I drove into Keene, NY on Route 73, turned right on Hurricane Road, turned left onto O'Toole Road and followed it to the end (past the snowplow turnaround). In winter, you'll have to walk a little bit further, since the last part of the road is a seasonal road. In non-winter, any vehicle should be able to drive to the hikers parking lot at the end of the road. 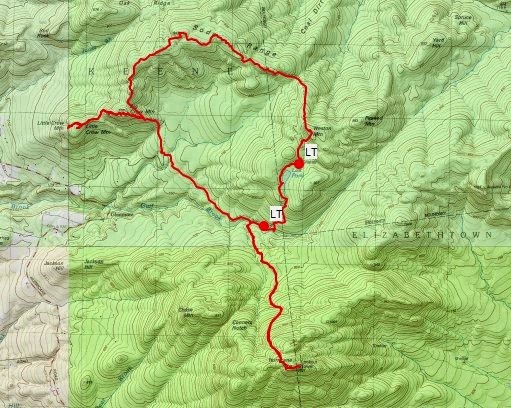 I decided to go clockwise and hike the 2 Crows, Big Crow Mountain (2812') and Little Crow Mountain (2559')first, followed by the Nun-Da-Ga-O loop. 2 trailheads exist at the parking lot. The left one goes to the Crows and the right one heads for the Nun-Da-Ga-O loop and a trail to Hurricane Mountain. It's a short hike to Big Crow Mountain; it took me 20 minutes to go the .7 miles to the summit where I was rewarded with spectacular views. If you are looking for a really short hike with views, a hike to Big Crow would bit the bill. This trail is marked with red disks. From Big Crow, I continued on to Little Crow. Near the summit of Little Crow is a short blue loop trail which takes you to the actual summit (marked by a large rock cairn). The red trail continues down the ridge. I took the blue loop, then headed back to Big Crow and back towards the parking lot to pick up the Nun-Da-Ga-O herd path. The beginning of the Nun-Da-Ga-O is marked with a small sign. After about 10 minutes on the Nun-Da-Ga-O herd path (no trail markers), my dog Rev was in front of me when she saw movement ahead. I glanced up and saw a porcupine about 5 feet ahead of her on the trail. I told Rev to stop and she did. We bypassed the porcupine by stepping off the path and going around it. Soon we began a slow climb up the Nun-Da-Ga-O ridge. 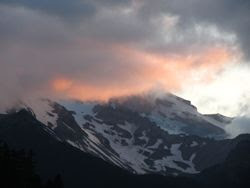 The early part, and late part are in the woods, but the middle part follows a partially open ridge with lots of views. At the end of the ridge is Weston Mountain (3186'). I passed over Weston and started down to complete the loop. There are 2 lean-tos on this part of the hike: the Biesemeyer Lean-to, and the Gulf Brook Lean-to. The Biesemeyer leanto is closest to Weston Mountain and the lean-to has recently been rebuilt. Rev and I stopped here for lunch. At this point, the marked trail resumed for the rest of the loop. Lost Pond lies just south of the lean-to and a short herd path leads to it. Back on the trail, which passes close to Lost Pond, I continued just over a mile to the Gulf Brook Lean-to. This lean-to has recently been relocated to .1 miles upslope away from Gulf Brook. The tought the new location was nice. The former location is now a grassy clearing with a log bench to sit on. Adjacent to the former lean-to location is the trail to Hurricane Mountain. It was early in the day so I decided to take the 1.9 mile trail to Hurricane. I was surprised to see quite a few people on this trail on a Friday. I also counted 9 dogs. I expected this to be the least traveled trail of the 3 that lead to the summit. Maybe that's why everyone with a dog was on this trail! The lower part of this trail to Hurricane has recently been rerouted and is still wonderful duff. The upper part is more rugged and contains the usual rocks and roots. There was not much mud to contend with though. After an hour, I had climbed the 1.9 miles to the top. This was my third time on Hurricane (once from each trail) and each time there has been quite a crowd on the summit. There is good reason for the crowds, since Hurricane offers great views in all directions. I don't know how many high peaks can be seen, but it is a lot. Lake Champlain is also visible . I took the same trail down Hurricane and followed the very easy remaining mile of the Nun-Da-Ga-O loop back to the parking area. It was still only mid-afternoon, but I decided to call it a day. This was my first time on the Nun-Da-Ga-O loop in summer. My previous trip here was in the winter, so it looked entirely different this time around. Great photos and story. Been on Hurricane and the Crows a few times, haven't got to Nun-Da-Ga-O. Now I have to.